Sheet metal fabrication is an indispensable part of mechanical processing, especially in aviation, household appliances, automobile, elevator and some other industries, sheet metal parts are widely used. As the solo forming process in sheet metal fabrication, the bending is one of the most important processes in sheet metal processing. The quality of the bending process will directly affect the forming size and appearance of the product. Therefore, how to guarantee the forming dimension and angle of the workpiece in the bending process is an important research content in bending technique. With the development of the economy and the improvement of people’s living standard, the goal of people’s sensory pursuit is also increasing. 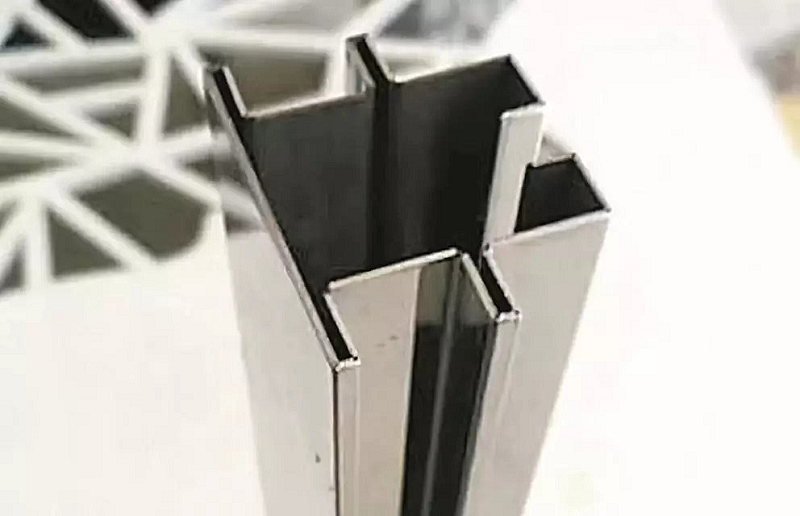 The more complex the shape of the metal sheet decorations bend, the more can reflect the designer’s design level and trendy style, thus attracting the majority of customers’ eyeballs. At the same time, the workpiece should meet the technical requirements such as the circular arc radius of bending edge should as small as possible, no bending marks on the workpiece surface, and no indentation on the decorative surface. 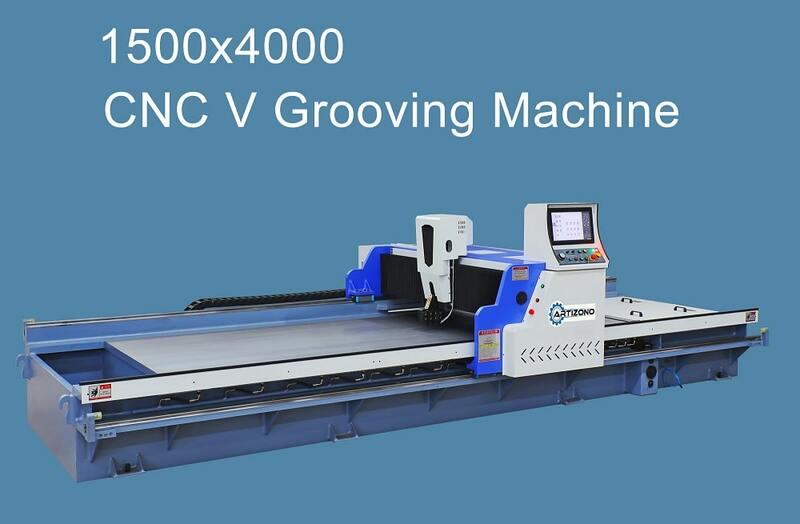 The traditional press brake machine has been unable to meet the special technical requirements, so the technology of grooving bending on the sheet metal emerged. In this article, we mainly describe the characteristics of grooving technique, how to groove sheet metal, and how to ensure the size and angle during the bending process. 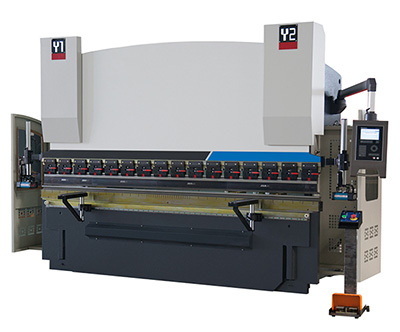 In the traditional bending technique, the bending of sheet metal is realized by the pressure of the upper and lower die on the press brake. The sheet metal is bent by the two edges of the opening of the lower die and the top edge of the upper die. The metal plates undergo a process from elastic deformation to plastic deformation. The bending angle is determined by the depth of the upper die into the lower die, and the bending radius R is greater than or equal to the plate thickness t (Fig. 1). Nowadays, people have higher and higher requirements on workpiece shape. For some workpieces with complex shapes (as shown in Fig.2), the traditional bending techniques are not able to bend, and the traditional bending method cannot control the bending radius, so it is difficult to achieve the technique requirements of non-indentation bending. As a result, a new kind of bending technique – the groove bending technique emerged. First, let’s define what is a groove bending technique? Groove bending is the technique which makes use of grooving machine to groove a line of V-slot on the sheet metal where needs to be bent, then bend it on the press brake as per the requirements. It can be known from the bending technique that the maximum arc radius of the edge of the workpiece is directly proportional to the thickness of the plate after bending. The thicker the plate, the greater the arc radius of the bending. After V-grooving on the metal sheet, the remaining thickness of the sheet becomes half the original, or even smaller. This can make the arc radius significantly reduced after bending. In addition, due to the thickness of the remaining plate at the bending point after grooving is thin, the deformation force during bending will be correspondingly reduced, which will not affect the unbending area. Therefore, there are no bending marks on the surface of the workpiece after bending. In this way, it can meet the technical requirements of small arc radius of workpiece edge, no bending marks on the surface and no indentation on the decorative surface in high-end places such as hotel, bank, commercial center and airport. In the bending technique, the required bending force of the sheet metal is proportional to its thickness. The thicker the sheet metal is, the greater the bending force is required, and the press brake tonnage is accordingly increased. After the v-grooving is made on the bending part of the metal plate before bending, the remaining thickness of the plate is greatly reduced. In this way, the bending force required for the bending of the plate will be correspondingly reduced, so that the thick plate can be bent on the bending machine with a small tonnage. This not only reduces investment in equipment but also saves energy and space. The part shown in Fig.2 cannot be bent and shaped on a normal bending machine, but it can be done by hand after a V-shaped grooving is done at the bending point. In addition, the method of controlling the remaining thickness of the sheet can be used to control the spring back force and angle. 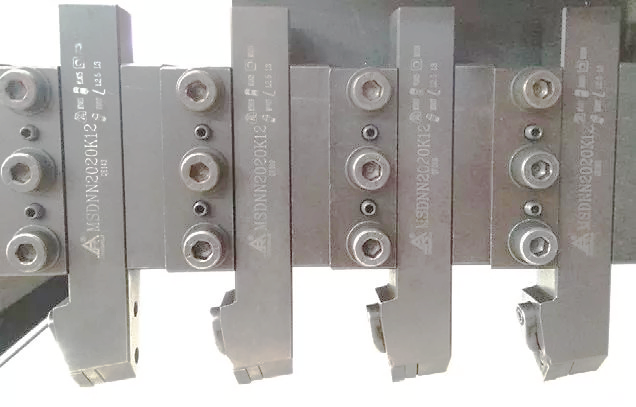 If the remaining plate thickness after grooving is controlled at about 0.3mm, the spring back angle can be made very small, and the spring back can be basically ignored. In sheet metal production, the gantry planer and metal sheet grooving machine are often used for v-shaped slotting of the metal sheet. Place the bent plate into the grooving machine for positioning, and then input the thickness of the plate for automatic grooving. During grooving, attention should be paid to the following two aspects. In the case of certain plate thickness, the groove depth and the remaining thickness are a corresponding value. According to the bending technique requirements, a residual thickness value is first set, which is generally set as 0.8mm by default and should not be less than 0.3mm at the minimum. Then set the times of grooving and grooving depth according to the thickness of the plate. Since the metal burr needs to be controlled and the knives should be protected well, the amount of knives feed should not be too big. Generally, the depth of first time grooving can’t exceed 0.8mm, and the grooving process should be done for at least two cuts. It’s not suitable if the grooving process finished in one cuts. For example, to groove one stainless sheet metal with the thickness of 1.2mm, after grooving the remaining thickness is 0.5mm. If set the first time grooving feed at 0.5mm, and the second time grooving feed at 0.2mm. The remaining thickness of the sheet is just 0.5mm after grooving and there is very less metal burr, as shown in Fig.3. It can be known from the bending technique that the sheet metal has different degrees of spring back deformation during bending, resulting in the deviation of the bending angle. The groove can be done properly according to the required bending angle of the workpiece during the v-grooving process. General the V grooved angle is 1-2° larger than the bending angle. 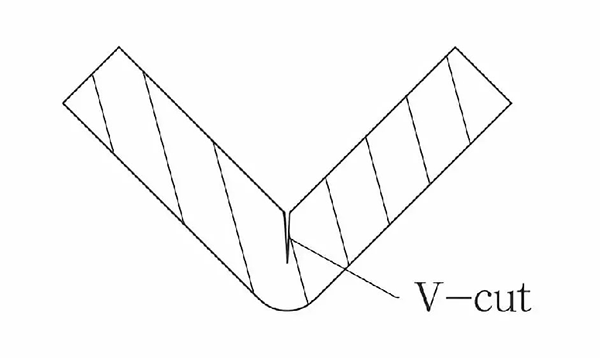 For example, if bending a workpiece with the angle of 90°, the V grooving angle can be set at 92°(Fig.4). In this way, the angle error caused by the bending spring back can be well avoided (Fig.5). The types of grooving knives are mainly divided into rhombic top-angle grooving knives, square grooving knives, triangular grooving knives and circular grooving knives, etc (fig.6). Suitable knives can be selected according to different shape and angle of the V groove. The angle of the knives should be less than the angle of the V slot when shaping the ordinary V groove. 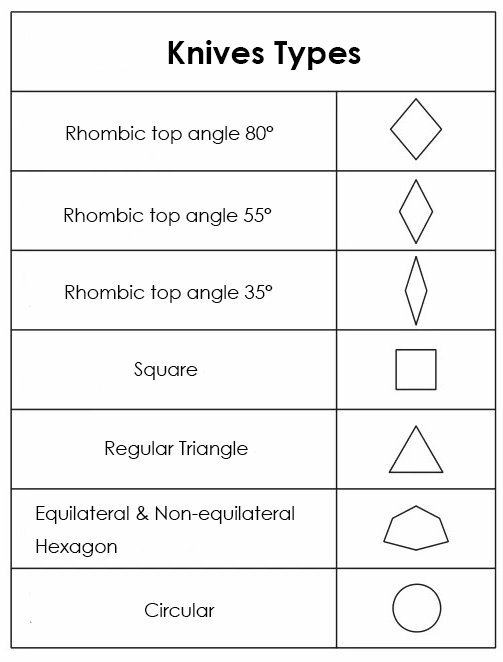 For example, if the V groove angle is 45 ° ~ 60 °, the rhombic knives with 35° top angle should be selected. For 60°～80° V grooving, triangular grooving knives should be the choice. For 80°～90°V grooving, the rhombic knives with 80°top angle should be selected. If the v-grooving angle larger than 90°, the square knives should be chosen. Besides, the circular knives should be selected for grooving round shape. When grooving long sheet metal with deep depth, the knives will be damaged by too much heat if grooving continuously with only one piece of the knife. Besides, there are some other problems such as worse grooving effect and too many metal burrs. For example, when grooving one stainless steel plate with the length of 2m for 2mm depth, if the first knife feeding amount be set at 0.5mm and grooving for 2m continuously, the knife will generate a lot heat and turns soft, which is easy to reduce the grooving quality after 1.5m and increase the burr size. If the knife feeding amount is 0.2mm, 10 times grooving will be needed for finishing the grooving of the 2mm metal sheet, which greatly affects the fabrication efficiency. Therefore, in addition to setting the amount of knives feed, the number of knives working at the same time should also be set when grooving the plate with a longer size. In this case, 3 ~ 4 knives are generally used to work simultaneously (Fig. 7). The feed amount of each knife differs by about 2mm. If the first feed is 5mm, then the second, third and fourth feed are 7mm, 9mm and 11mm respectively. This can not only guarantee the quality of grooving but also improve work efficiency. For bending technique, the quality of bending mainly depends on the two important parameters – bending angle and size. ⑴ If the top punch and bottom die are not centered, it will lead to the error of bending size. Therefore, the upper die and lower die should be centered before bending. ⑵ The relative position of the plate and the lower die may change after the left-right moving of the back stopper, thus affecting the bending size. Therefore, the position distance of back stopper should be measured again before bending. ⑶ The lack of parallelism between the workpiece and the lower die will cause bending spring back and affect the bending angle. The parallelism should be measured and adjusted before bending. ⑷ If the angle of the first bending is insufficient, the second bending will also be affected. The accumulation of bending error will lead to the error increase of workpiece forming size and angle. Therefore, it is particularly important to ensure the accuracy of single time bending. ⑸ When bending, the size of the V opening of the lower die is inversely proportional to the bending force. 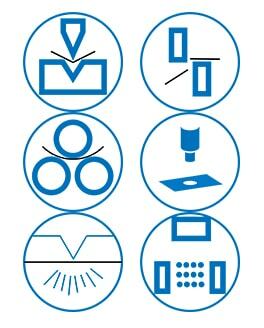 When processing metal plates with different thickness, appropriate V opening of the lower die should be selected according to the regulations. Generally, 6-8 times of the thickness of the plate is the most appropriate choice. 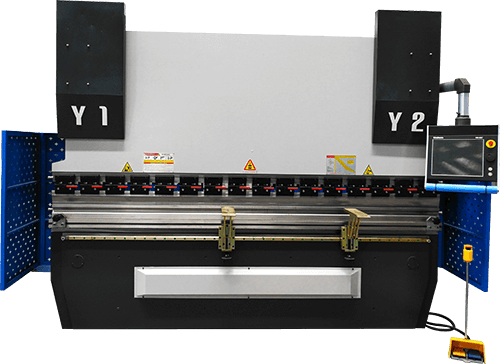 ⑹ When the workpiece is bent on the press brake after v-grooving, it is necessary to make sure that the upper ambiguous edge, the V-shaped bottom edge of the workpiece and the V-shaped bottom edge of the lower die are on the same vertical surface. ⑺ When bending the workpiece after grooving, the angle of the upper die should be controlled at around 84°so as to avoid die to clamp. I believe most of you already know how to calculate the unfolding length before grooving. Do you really know how to calculate the unfolding length after grooving? Let me explain this to you with one example. The following picture shows the sizes of each edge of the workpiece. The thickness of the sheet metal is 3mm. As a new kind of bending technique, grooving is the result of market selection. Only by mastering various processing techniques can we make better products. Only by constantly exploring and pursuing new techniques can we produce better products.